This is Manchester based Singer-songwriter Matt Hill’s third album and the previous pair were both critical successes; getting him to support acts as diverse as Lambchop, Neko Case and Richmond Fontaine. 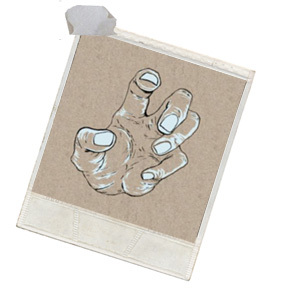 The album cover is minimalist, to say the least – single sided brown card with a sketch of an open hand as the artwork ; so far, so average. Then I slid the disc into the player and was knocked sideways by the opening song, Days of Surveillance which is a raw and rye observation of the world we live in and; as a semi-professional cynic I should have been able to pick fault with the simplicity of the lyrics and sentiments; but I can’t. Matt Hill has peeled all the layers of our lives back until you listen intently to every single word and phrase he uses and nod in humble agreement. The Ghost of Oswald Mosley just might be the finest observational song I’ve ever heard. Hill chooses to have the racist that the song is about, eating a samosa; which is the ‘irony’ that I see in every racist I’ve ever encountered in an Indian or Chinese take-away on a Friday night. The song goes on to list the subtle ways that institutional racism has crept into our lives without us realizing it; which as a very sad thing to have pointed out. The title track Greedy Magicians, is a delightful tune that compares Magicians….to…well; I’ll leave that for you to work that out; but this song casts a shadow over many countries and only one industry as we head ever deeper into recession. Every track is interspersed with polite applause as the album was recorded in a Church, before 100 invited guests and the acoustics certainly aid the overall sound and power of the songs; but GREEDY MAGICIANS isn’t a Live Recording in the way we know them as there are no introductions or chatter. Personally I would have kept We Will Not Forget for the finale as its very English sing-a-long list of great Socialists, Social Reformers and bloody good blokes and has had me shouting out the lyrics while driving (alone) in the car. Thankfully the artist knows best and after all as Don’t Despair is a song which is exactly what it says on the tin – a simple, but beautiful song of hope for us all. GREEDY MAGICIANS isn’t your average ‘protest album’ as Matt Hill never gets angry and his voice is a soft and sweet as a wine gum plus he is supported by some amazing musicians that include an accordion and a small string section; so this isn’t Neil Young by any stretch of the imagination as the songs and phrasing are intrinsically English. This album will appeal to and touch fans of Richard Thompson, Billy Bragg and John Martyn across the Globe.